Planter boxes installed on the roof six years ago trapped water and caused the roof to rust. Off they went! They were heavy. 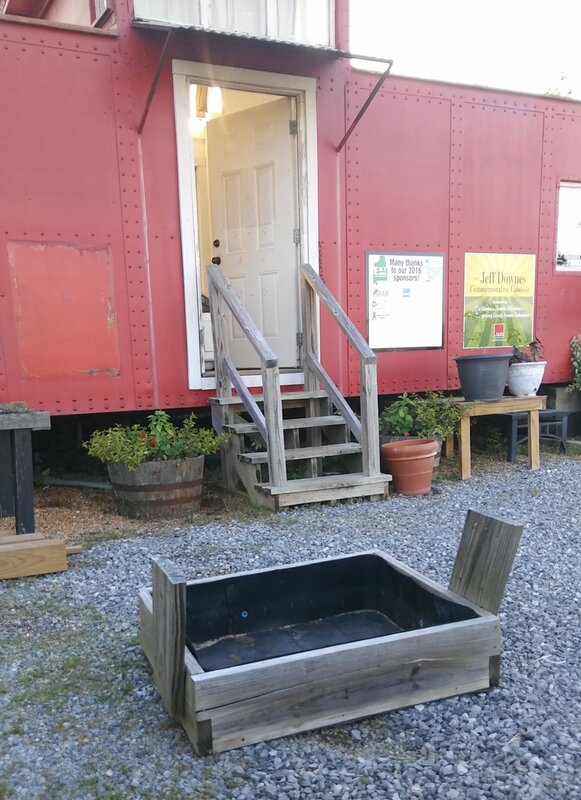 We'll recycle them into planter boxes around the caboose. A cooler for produce storage, piles and piles of stuff, and a fire extinguisher. Safety first! E.A.T. South is moving all of our operations to the farm, and we’re building ourselves a tiny office. Maybe you’ve heard of tiny houses? They’re the 200+ sq ft structures sometimes featured on home improvement channels. Our tiny office for three will be in 272 sq ft of a renovated little red caboose. Farm visitors (kids but lots of adults, too) always want to explore the caboose, but there has been nothing to see. It’s been like our backyard shed where we store everything from old paint to broken chairs, and it’s too hot in the summer and too cold in the winter to be a work space. All of the windows leak. There’s mold. There are mice. There are ants. There are roaches. Eeeew! Leaky windows lead to mold. Climate control - we need to be warm in winter and cool in summer. Space for four people to work. Windows that don't leak and open for fresh air. All of the windows leak. Must be as ecologically responsible as possible - because we're like that. No restroom - There are no sewer lines at the farm. We have to use the port-a-potties, but no bathroom gives us more office space.